We're also hearing from a reddit thread that Fifth Third Bank and some local banks are no longer compatible with Android Pay. Last year around this time, Google announced that unsupported cards already in Google Wallet accounts would be able to be used with Android Pay, but only for a limited time. Problem was, we didn't exactly know how long Google's "limited time" would be. 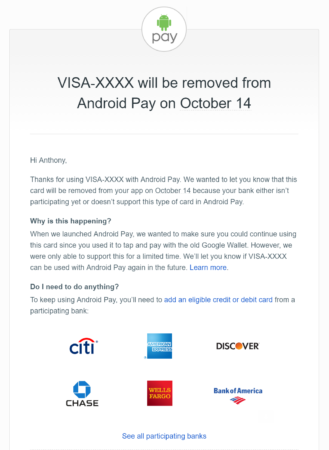 Thanks to a ton of emails that were sent out to Android Pay users with unsupported cards today, we now have an actual date: October 14th, 2016. Or maybe it's the 15th; the emails that were sent out and Google's support page have conflicting information. Either way, in around two weeks, you will no longer be able to use your grandfathered Google Wallet cards with Android Pay. If this is happening to you, it's either because your bank still isn't participating in Android Pay, or because your card isn't supported. Depending on whether or not you've got another card that is supported in Android Pay, you'll receive one of two emails. If you have another supported card, Google will simply tell you that no action is needed, and that you can keep using Android Pay with your other cards. If you don't, you'll get an email telling you to add an eligible card. At least we got Chase support around a month ago, right?